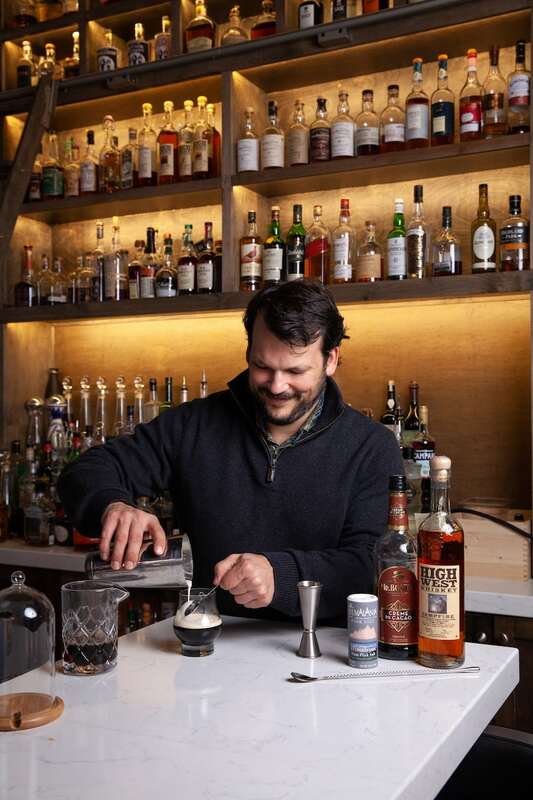 Staring down his second winter in the North as Pour Kitchen & Bar’s cocktail guru, Louisiana native Jonas Sevin is battling the Petoskey cold the best way he knows how: with hot toddies and cutting-edge coffee drinks. 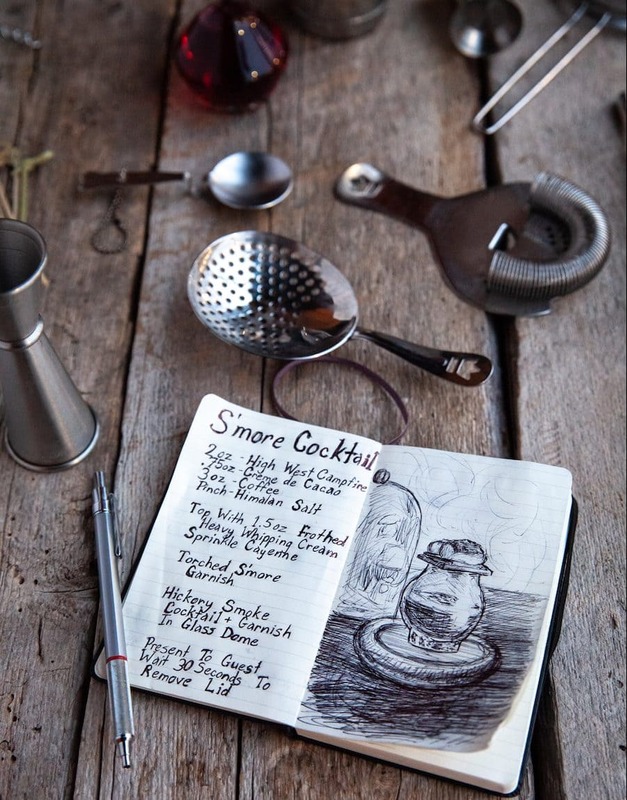 He shares his favorite hot cocktails and offers wisdom for building up your home-bar arsenal. Jonas takes a culinary approach to cocktail creation wherein drinks orbit a balance of salt, acid, heat and sweet. His coffee drink drives out the chill with smoked rye whiskey and spicy cayenne while a riff on the classic hot toddy uses allspice-infused syrup. Pour Kitchen & Bar’s Jonas Sevin shares some essentials for après-ski swilling in the comfort of your own chalet. A crockpot is essential for mulled cider and hot batch cocktails while single serving cocktails can take on a smoky dose of campfire essence with a smoking gun and glass dome. Keep snifters on hand to enable a splash of cognac or small batch bourbon and clear glass footed mugs for toddies and spiked coffee drinks. Jonas likes an arsenal of homemade spice-infused simple syrups, Creme de Cacao, bitters, of course, and chile-infused liqueurs like Ancho Reyes to add some heat. It’s brown liquor season so make sure your cabinet is stocked with bourbon, rye, scotch, dark rum and brandy. Stack chocolate and marshmallow on graham cracker and toast the marshmallow using a small kitchen torch. In a pre-heated glass coffee mug, combine whiskey, Creme de Cacao, coffee and salt. Stir and garnish with whipped cream topped with a sprinkle of cayenne pepper. Serve s’more garnish on top. For the allspice simple syrup combine 1 cup water, 1 cup sugar and 1 1/2 teaspoons of allspice in a saucepan. Bring to a boil and stir until sugar is completely dissolved. Set aside to cool. In a pre-heated glass coffee mug combine bourbon, simple syrup, lemon juice, bitters and lemon wheel. Add hot water and serve. Traverse food and drinks editor Tim Tebeau writes from Petoskey. dining@traversemagazine.com. // Dave Weidner is a freelance photographer based in Traverse City. dweidnerphoto@gmail.com.